A few days ago we posted a blog concerning one of the most shocking events of the 20th century: The 1969 Tate Murders by Charles Manson and his followers. As we reflect back on the turbulent 1960’s, the tragic and bizarre murders seem to have been a somewhat appropriate ending to a very troubled era in American history. Perhaps ironically, nearly 100 years prior and on the opposite coast, the New York Times (October 26, 1860) was reporting about two other societal stressors: billiards and baseball. 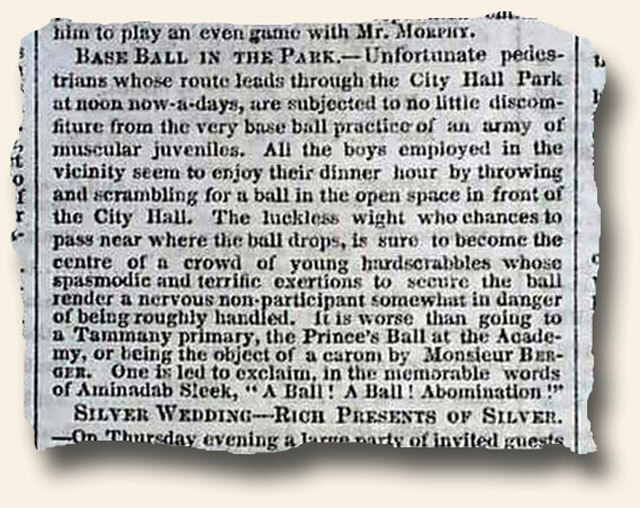 While we all can appreciate the horrors of billiards (who doesn’t identify with “Ya got trouble, right here in River City”), the article on baseball is what catches our attention. Apparently, young boys playing baseball in the park were creating a high degree of angst among the strollers of the day. Who among us would not trade the distractions and temptations of today’s youth for the youthful pastime activities of yesteryear?